Sitting there on the floor was Auggie. Just a cute little teddy bear, but a bear on a mission. Auggie wanted to take part in the NDSU Student Athlete Advisory Council (SAAC) toy drive. 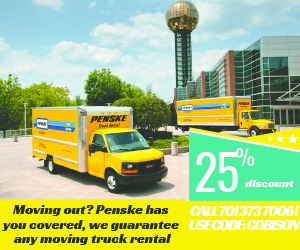 The drive ends this upcoming weekend. 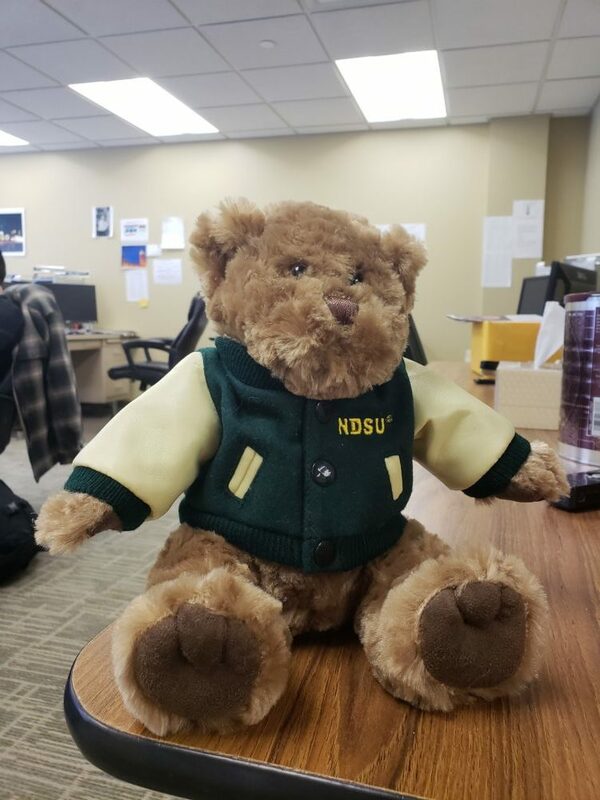 Lightly used toys can be donated at the North Dakota State football and men’s basketball games Saturday and ends with a teddy bear toss at Sunday’s women’s basketball game. 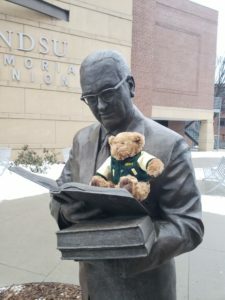 Auggie knew that the teddy bear toss will be the end goal, but until then, he wanted to go on adventures on the campus of NDSU. For the next week, Auggie wanted to make sure he could do as much stuff as possible. Almost immediately, there was a problem. The fact that other people had to work meant that he would have to wait to go on adventures. So, to make Sports Editor Taylor’s job go faster, he decided to help him out. Ironically, Taylor was writing a drink review for the Features section. 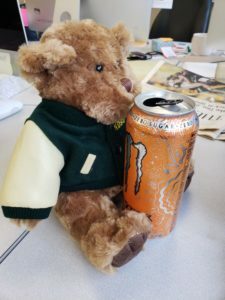 Auggie managed to down a whole Monster Energy drink in order to help. The plan backfired, as Taylor had to chase the caffeinated bear around. With the story done, and bear calmed down, it was time to head out. 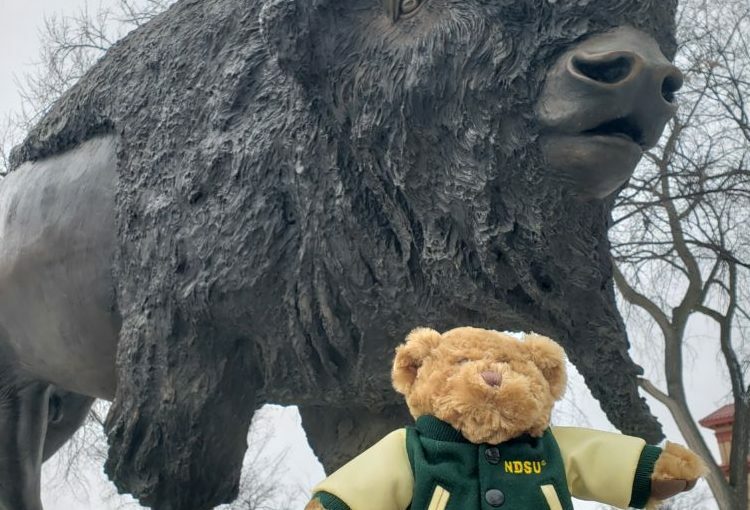 First stop, the Bison statue that welcomes guests onto campus. 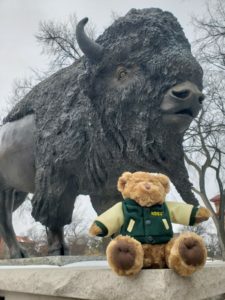 A big grin appeared on Auggie’s face as he sat down next to the Bison. Yet the work was not done. 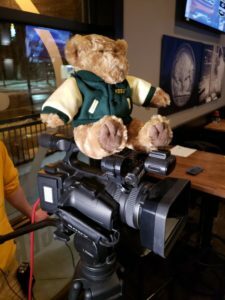 This time it was Auggie’s turn to do the work, joining the Bison Information Network crew talking about the FCS Playoffs. However, Auggie got camera shy just before he went on. So instead of being in front of the camera, he ended up behind it. Have to get the picture with the statue. 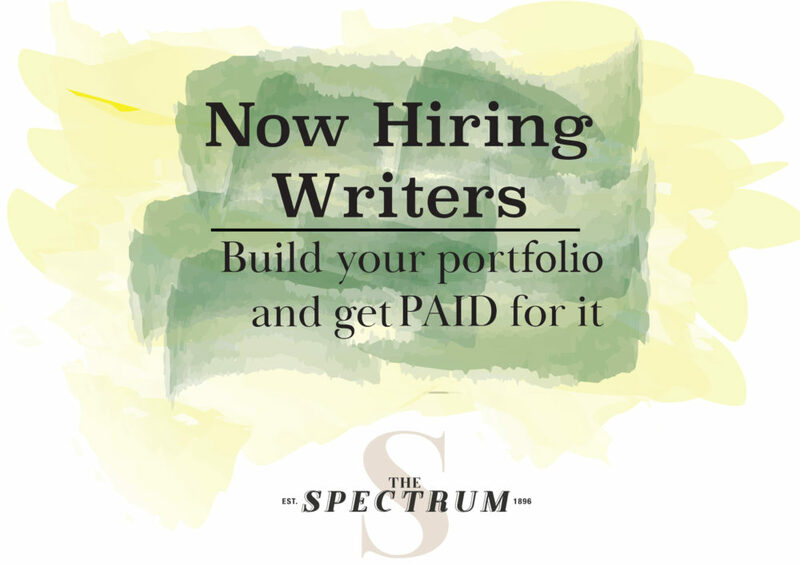 It was another day around The Spectrum office. 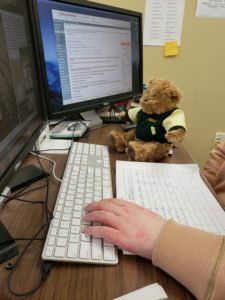 Auggie tried to help out the news team break some stories, but then came running back to Taylor after Co-News Editor Ryan started throwing out political jargon. But not all was bad for Auggie. Thankfully, he found time to listen to a story. A. Glenn Hill was reading a story out in the plaza, and Auggie snuggled in and listened to the story. 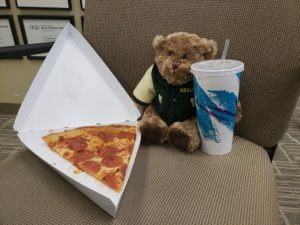 Lunchtime at the Spectrum office. Story time with A. Glenn Hill. Now the day Auggie was looking forward to the most. 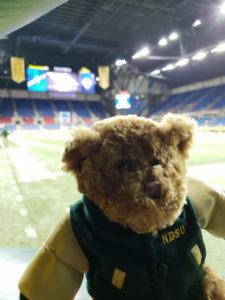 He would be joining Taylor and Sports Writer Thomas at the Fargodome, as the Bison took on Montana State in the playoffs. Upon entering the stadium, Auggie quickly rushed to the field. The lights shimmered in his eye, as he headed toward the inflatable helmet the players run through onto the field. Sure enough, run through it he did. Up in the press box, Auggie’s drive to help out ended with him trying to take Thomas’ spot as he got a drink. Taylor quickly put a stop to that and told him to just sit down and watch the game. The discussion at halftime revolved around the stories that would have to be written after the game. 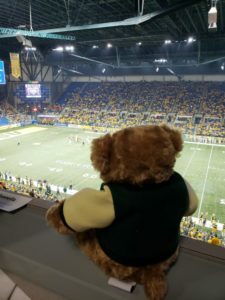 Auggie insisted that the pair make puns about Bison running back Lance Dunn, who had four touchdowns already. Taylor gave in and wrote a few. 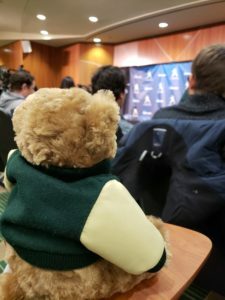 After the game, Auggie went down into the press conference. He said he wanted to ask Dunn a question, but was too scared to do so. Photo op in the big helmet. Not a bad view from the press box. Waiting for the press conference to start. This was supposed to be an off day, a day to relax. Auggie had different ideas of course. He went into The Spectrum office to help with the paper layout and sendoff. Sure enough, Design Editor Brittany let Auggie lay out the sports section (and confirmed Taylor put in some Dunn puns). While at the office, Auggie also got wrapped up in helping Head Copy Editor Zach move a couch. That couch was heavy, and Auggie barely helped. Helping lay out the paper. The first day of dead week. Auggie was bright-eyed by 7:30 in the morning and was cheery to walk into class at 8 a.m. He was more awake than most of the class, as they drudged in for one last regular week of classes. But after a pair of classes, Auggie decided that he wanted to go learn something that he could use. 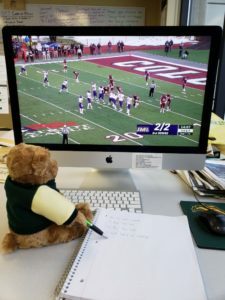 After listening to how much film quarterback Easton Stick watches each week, he decided to try his hand at it. When Taylor got back to the office, Auggie already had a bunch of notes on Colgate. However, Auggie had linebacker Jabril Cox playing offense. To be fair, Cox does have a pair of defensive touchdowns this year. After that, a nice easy night watching Monday Night Football was on tap. Sure enough, Bison alumnus Carson Wentz was on and won. It was an 8 A.M. start on Monday. Auggie trying to be like Easton Stick. Another day of work, but this time not with Taylor. No, Auggie got “adopted” by Head News Editor Phoebe. He sat on her lap as she wrote her section. Sure enough, they got their work done in time. After all of that hard work, Auggie deserved another story time with Mr. Hill. 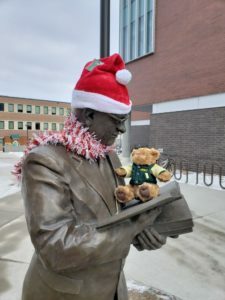 This time, however, he got distracted by a festive hat on the reader. The story was good, probably. That is a nice hat there. Back with Taylor, Auggie got to finish the student media trifecta. Joining Taylor, Thomas and Opinion Editor Jacob on their radio show. Yet again, he got a little shy just before going on air. So instead, he directed the show without a hitch. 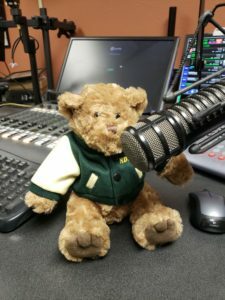 After the radio show, Auggie joined the rest of The Spectrum staff for their weekly meeting. Feeling encouraged, he stole the show from Editor-in-Chief Leif and ran the meeting. Auggie live on the air. But the upcoming weekend is the most exciting. Saturday brings with it another Bison football game, this time an FCS quarterfinal against Colgate. After the early game, the men’s basketball team hosts Eastern Washington. At both events, Auggie hopes to say hi to the other toys donated to the SAAC toy drive. And that brings Auggie to the big day on Sunday. 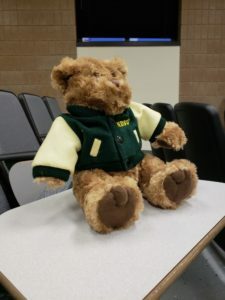 At halftime of the NDSU women’s basketball game against Milwaukee, Auggie will be donated in the teddy bear toss. At that point, this chapter of Auggie’s adventures comes to an end, and a brand new chapter begins.